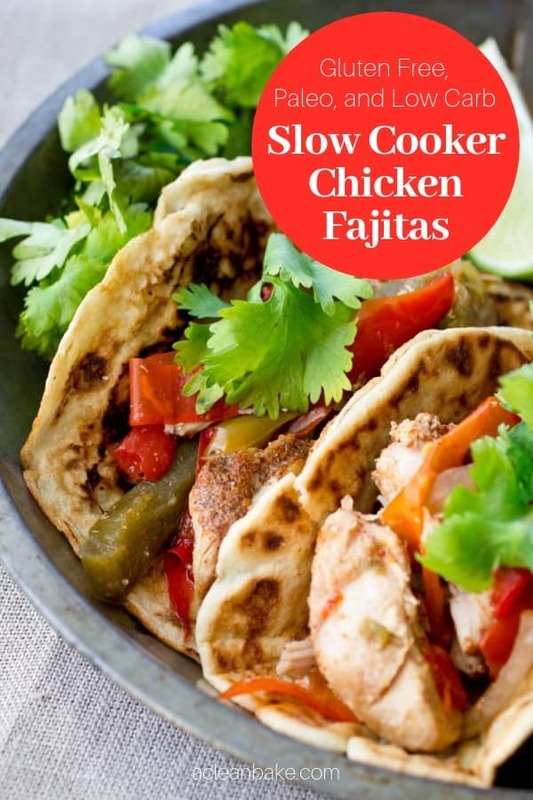 Crockpot chicken fajitas make a fast and easy meal with minimal hands on time. Just put your chicken, veggies, and a quick homemade fajita seasoning in the crock pot and let the machine do all the work! 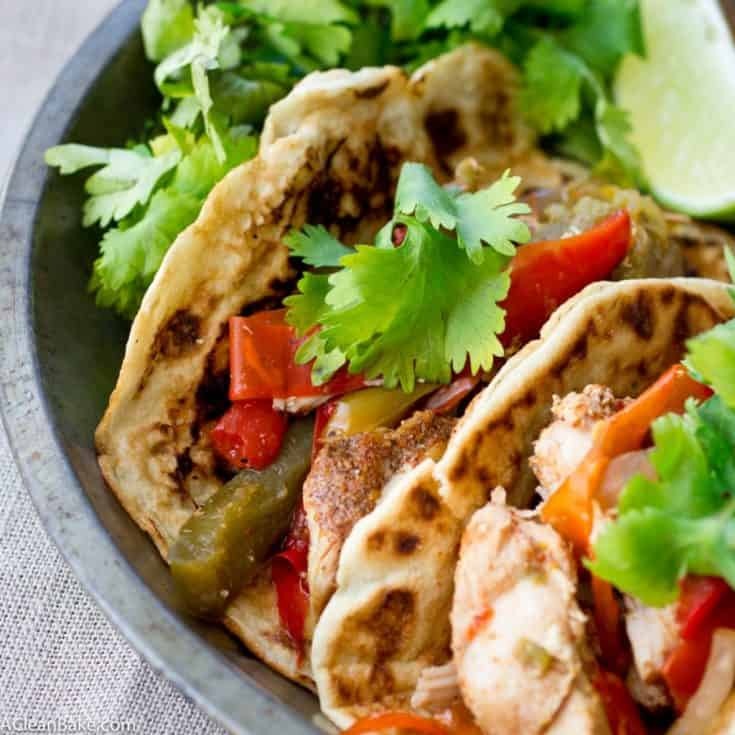 Serve it with grain free tortillas for a healthy, gluten free and paleo friendly meal. This is the best kind of fast food! People always ask me how I have managed to cook so much without a kitchen these last couple of weeks, but from my perspective, the question is: how could I not? Eating out too much grates at me: I like knowing what’s in my food; I like it to taste just the way I like it. I find chopping and stirring to be soothing, and there’s nothing more satisfying than sitting down in the evening with a home cooked meal of whatever means comfort food to me at that moment of that day. In the last five days I’ve been in five trains, four planes, three airports (in three different states [in three different time zones]), two hotels, one tram and what feels like one thousand Ubers. I’ve eaten in hotels, airports, bars, parties and Whole Foods, and I’ve sincerely missed cooking. The kind of food preparation I’ve been doing lately may be simplified down to only the very essential tasks (chop food into bite sized pieces, flavor, heat) but it is still soothing in a way that ordering will never be. I’m finally home today, with no plans, for the foreseeable future, to travel any further than the tile store, and – more so even than sleeping in my own bed – I’m relieved to be back to my kitchen, however campsite-like it may be at the moment. This meal welcomed me home; I had made it before my trips, socked it away in the freezer and forgotten about it until I really, really needed a flavorful, ugly, hearty, vibrantly flavored home cooked meal to cure me of the lingering taste in my mouth of airport salads, Food That Comes In Bar Form, and an excess of trail mix. 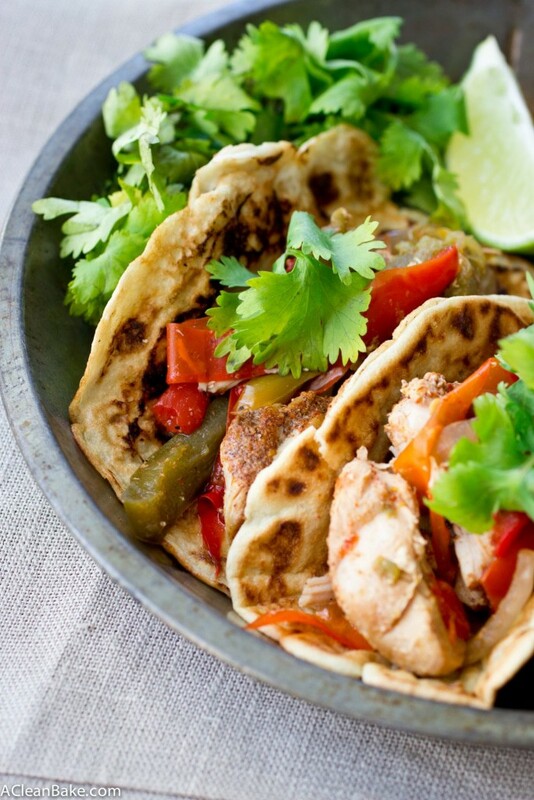 Crockpot chicken fajitas are a better kind of frozen dinner. My only other kitchen renovation experience was when I was a kid, maybe 10 or 11, and my recollection of that time was glee at the sight of the freezer piled high with Stouffer’s frozen mac & cheese and fettuccine alfredo tv dinners (the two were neck and neck for my favorite meal at the time), which I was otherwise very rarely allowed to eat. Without those, I sometimes wondered as we prepared for this project, what would be left? For a number of reasons, primarily financial and sanity-related, dining out for every meal for 2 months was not an option. Never in a million years, no matter how handy I could have ever imagined this device to have been, could I have predicted that the slow cooker (crockpot) would be the lifesaver it has turned out to be. 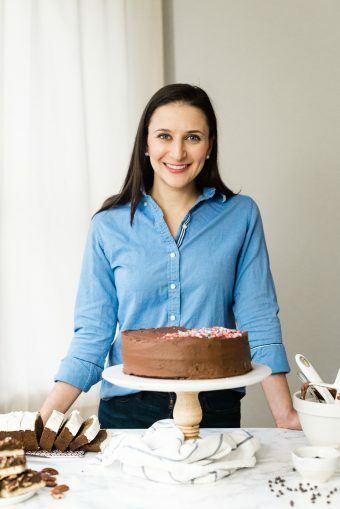 That, in a nutshell, is my secret for cooking when your kitchen, or your energy level, or the number of hours in the day, simply isn’t working in your favor. There is nothing better than a meal that takes few ingredients, little prep, minimal hands-on time and makes enough for leftovers. While, admittedly, that describes a TV dinner, crockpot chicken fajitas are less, you know, disgusting-and-horrible-for-you than the pre-packaged frozen equivalent, and it takes only a few minutes more to get going. And, like most of the food I’ve been making lately, it freezes and reheats well. Let the machines do all the work, and all you have to worry about is working up an appetite. For that, may I humbly suggest a session of sock skating? Updated to add: A few readers have asked what size and model crockpot/slow cooker that I used for this, because it has some bearing on cooking time. This 4-quart model is the one I use. 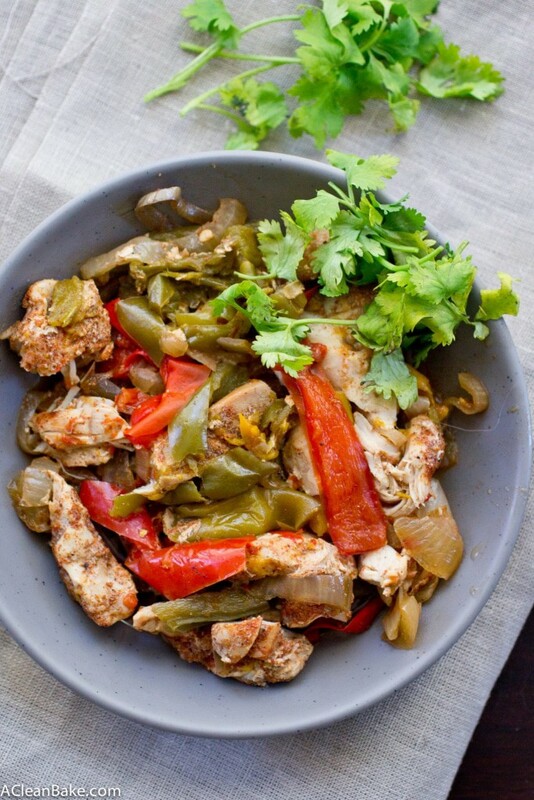 In the bowl of a crockpot/slow cooker, toss together the prepared peppers, onions and chicken. In a small bowl, stir together the remaining ingredients to combine, then sprinkle the spice mixture evenly over the peppers, onions and chicken. Toss gently to distribute the spice mixture. Cover and cook on low heat for 5-6 hours until the juices from the chicken run clear. Serve immediate over rice, cauli-rice, or grain free tortillas. Optionally, you can finish with a squeeze of fresh lime juice and some chopped cilantro. Freezer instructions: Complete steps 1-3 in a large mixing bowl, then transfer the meat and veggies to a zip top freezer bag. When you're ready to cook, defrost in the fridge, then throw it in the slow cooker and complete steps 4-5! You can also freeze cooked leftovers if necessary. Store leftover filling (separate from the tortillas) in an airtight container for up to 3 days. Feel free to double the spice mixture and save half of it in an airtight bag or container for next time. Store it at room temperature if you're going to use it within the next 3-4 weeks, and in the freezer if you'd like to keep it for longer. Spice mixture loosely adapted from Wellness Mama. This sounds so flavorful and delicious. I agree with you on eating out… I honestly enjoy my food best. Glad I’m not alone on that one, Liora! PHEW! Sounds like you’ve had quite the busy week. I’m tired just reading about it! haha. NOTHING better than coming home and getting to eat a meal that YOU made … and I can’t believe you did so without a fully functioning kitchen! You are a rockstar. Aw, you’re too sweet. Thanks, Leah! Yasssssssss these look delicious! I’m glad you’re finally back home! Three time zones?? You are a traveling boss Nora! And these fajitas look freaking amazing. I miss homemade Mexican food and these … wow, they look so good. Fantastic job! Yeah, technically I crossed all four (though I on;y stopped in three). My goodness, I am glad to be home! Oooh!! Wow you’ve been traveling around quite a bit these past 5 days; that’s crazy! 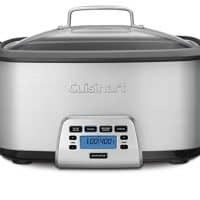 I completely agree — dining out may be great for the short run, but nothing beats a home-cooked meal when we’re in it for the long haul (: Excellent use of a crockpot though! Usually, it doesn’t really come to mind as a food savior but certainly in your case! (: Hope you’re having a great day! No, I agree. The crockpot gets a really bad reputation as the source of a lot of sloppy, unhealthy comfort food. But it turns out that you can make a TON of healthy, delicious meals in it too! Can’t wait to try these fajitas in my crockpot!! I hope you enjoy them, Matea! Does any liquid go into the crockpot at the beginning of the cooking tome? Or just chicken, onions, peppers and the spice mixture? No, I don’t recommend adding any liquid. As long as your slow cooker is covered, the vegetables will release their moisture and that will be enough to cook everything. Otherwise it gets too soupy. Thank you for sharing your recipes- I really like them and that you make it easy. This slow cooker chicken was, as you say, very easy. We all loved it in my family and being Norwegian I will test the same recipe with dried cod (stock fish) because I think this will make an awesome white bacalao. Thank you for letting me know!! I really work hard to make the recipes easy and accessible (and, of course, delicious), so it is always so nice to hear that it is working 🙂 Please let me know how it goes with cod – I’m very curious! The fajitas were very nice. Personally I prefer thighs. My husband would want this to be a bit more spicey than I made it. Hey! 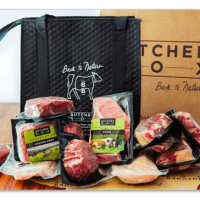 Is this still recommended to make even if I don’t have a slow cooker? Yes! You can definitely make it in a pan. Sautee the onions, add the chicken and cook until the pieces turn white-ish (but are not cooked through). Add the remaining ingredients and stir to combine everything. Cover and cook (stirring periodically) until the chicken is done. Enjoy! After I make this in the crock pot I can only freeze it up to 3 days?? Also, can I put the chicken in the crock pot frozen or does it need to be thawed? They look delicious. I can’t wait to make them! No, but you should freeze it within 3 days of cooking! Once frozen, it can keep for a month or two. I would highly recommend thawing the chicken before putting it in the crockpot to cook, if possible. This makes sure the chicken cooks evenly and prevents the chicken from being uncooked and at a temperature where bacteria can grow for too long. Looks fabulous! To prep and freeze for cooking another day… should I just put all in a freezer bag after Instructions Step 3 and freeze? Then thaw and cook as directed? Any modifications? Yes, I would recommend completing step 3 (obviously you don’t need to mix it all in the bowl of the crockpot, just any bowl), then putting it all in a freezer bag. When you’re ready to cook, defrost in the fridge, then throw it in the slow cooker and complete steps 4-5! This recipe calls for 2 lbs. of chicken, yet says it makes 4 servings? That’s WAY too much protein per serving! I’d say it makes 8 servings! You’re right; that’s a typo. Thanks for pointing it out! What kind of tortilla did you used?